The main marking and on some aircraft also the serial number with are displayed in 4 positions (ie above and below each wing, and on each side of the fuselage) of aircraft and on each side of the fuselage of helicopters. The fin flash and on some aircraft also the main marking are displayed on the rudder. Usually the inscription "FUERZA PUBLICA" is written on the fuselage sides. The main marking and on some aircraft also the serial number with are displayed in 4 positions (ie above and below each wing, and on each side of the fuselage) of aircraft and on each side of the fuselage of helicopters. The fin flash and on some aircraft also the main marking are displayed on the rudder. 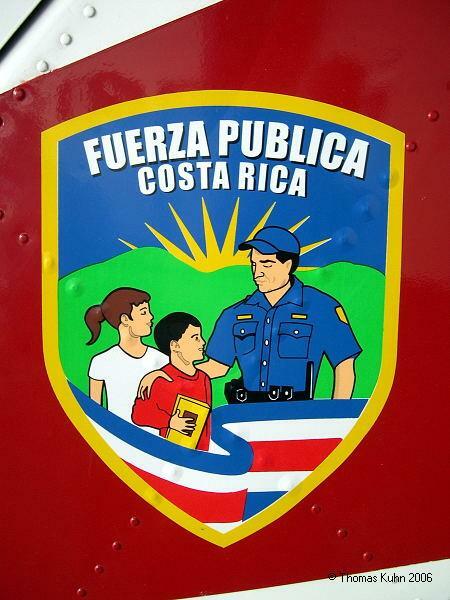 Usually the inscription "FUERZA PUBLICA", "VIGILANCIA AÉREA" or "POLICIA" are written on the fuselage sides. The Sección Aérea de la Guardia Civil (Air Section of the Costa Rica Guardia Civil) was established in 1957. During the next years Costa Rica bought a handful of fixed-wing aircraft and three helicopters for surveillance and liaison duties. In 1994 the service was renamed Servicio de Vigilancia Aérea and became part of the Ministerio de Seguridad Pública. 1994 The service was renamed Servicio de Vigilancia Aérea. Aircraft and helicopters of the Air Surveillance Service are fully operational. The civilian registration prefix TI was used until 1994. MSP is used for helicopters and fixed wing aircraft as a prefix from 1994 on. New registration numbers are given were available. False reports of aircraft on order or in service. The Air Surveillance Service has no subordinated units. The Costa Rican Air Surveillance Service currently operates from one major airbase and two secondary airfields. This page gives details of the air bases and airfields which were or are used by the Costa Rican Air Force and its successors.